Indoor air quality in homes, buildings, and schools is a silent-yet-critical component in the overall health and well-being of the individuals who inhabit them. In fact, the Environmental Protection Agency (EPA) states that poor indoor air quality is among the top global environmental health risks. 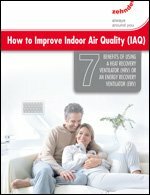 This white paper identifies seven benefits of using a heat recovery ventilator (HRV) or an energy recovery ventilator (ERV) and what you can do to improve indoor air quality in your home.